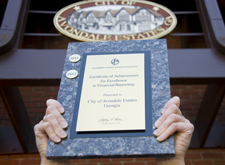 The Government Finance Officers Association (GFOA) of the United States and Canada awarded the City of Avondale Estates with the Certificate of Achievement for Excellence in Financial Reporting for its comprehensive annual financial report (CAFR). This is the highest form of recognition in the area of governmental accounting and financial reporting, and its attainment represents a significant accomplishment by a government and its management. The City has received this certificate every year since 1997. City Finance Director Ken Turner also received an Award of Financial Reporting Achievement for preparing the CAFR. Turner began working for the City in 2008 and has won this award every year since then, starting with the 2007 CAFR. According to the GFOA, the City's CAFR was judged by an impartial panel to meet the high standards of the program, including demonstrating a constructive "spirit of full disclosure" to clearly communicate its financial story and motivate potential users and user groups to read the CAFR. The GFOA is a nonprofit professional association serving approximately 17,500 government finance professionals.